ChargePoint operates the world’s largest and most open electric vehicle (EV) charging network. 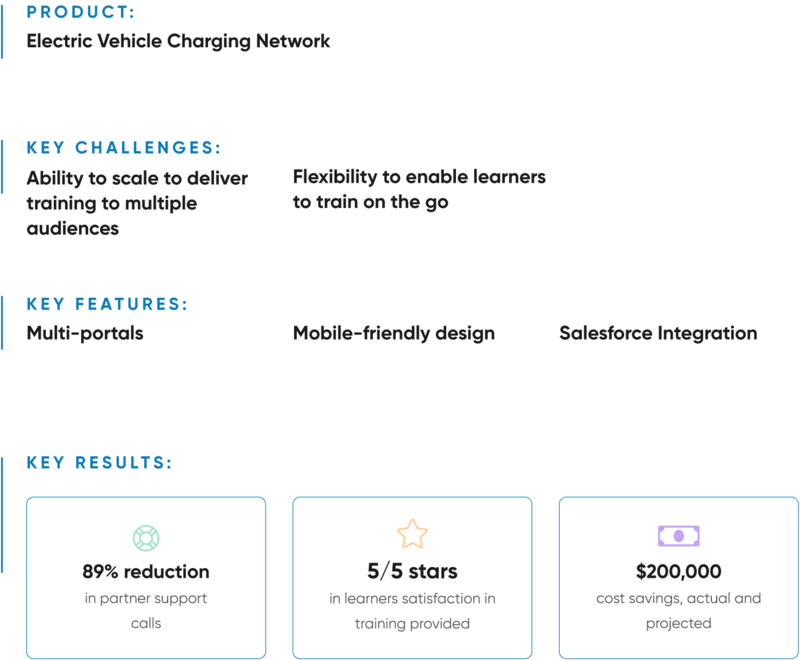 With a mission to get everyone behind the wheel of an EV and facilitate the charging process, regardless of car model, ChargePoint decided to invest in a learning management system (LMS). The business’s initial plan was to train and certify partners in an effort to reduce support, increase learner adoption, and decrease costs. They also wanted to safeguard their future with an LMS that allowed them to train different audiences as they grew. LearnUpon’s features and scalability proved to be the perfect fit and the results were immediate for ChargePoint. ChargePoint began their LMS journey wanting to train and certify their partners, known to them as installers. Each installer required training on how to effectively install their Smart Charging Stations for the end customer – a key factor to the business’s success. They were already using an LMS, however, it wasn’t meeting their needs. ChargePoint is growing. It’s a global organization and their original solution wasn’t able to keep up. It was also becoming extremely costly and didn’t have the functionality they needed to deliver and manage training the way they wanted. They needed a more scalable and cost-effective solution. So they began their search. The ability to scale. ChargePoint planned to initially focus on training their installers. But, they wanted the capability to roll out training to multiple audiences in the future. The flexibility of mobile-friendly training. As many of ChargePoint’s installers have their feet on the ground, a platform that allowed them to train anywhere, anytime on-the-go while out in the field was a must. A Salesforce integration so they could train and track their audiences effortlessly. Automated certifications and reminders to keep their partners’ training up to date. A pricing structure that worked for their organization. After going through the vendor selection process one LMS came top of ChargePoint’s list, LearnUpon. What stood out was its scalability. ChargePoint saw that LearnUpon’s LMS would be able to grow with them. It also offered multi-portal functionality. Right now, they could train their installers in one portal, and when they were ready, they could create additional, individual portals. Each portal tailored to their employee and customer training needs. “Even though we weren’t going to implement those right away, we loved the idea that functionality was available so that as we grew our learning programs internally and externally, we would have the multiple portals as an option." The responsive design and pricing were big ticks too. It enabled ChargePoint’s installers to train on any device, no matter where they are, at a price that worked for the business. The positive results of using LearnUpon to train installers were instant. They experienced cost savings, actual and projected, of $200,000 through to 2020. The support needs of installers also dramatically fell with an 89% reduction in support calls. This enabled their support team to spend time on more valuable tasks and gave installers a better user experience. Introducing LearnUpon impacted the training adoption rate of ChargePoint’s installers. Course completion rates soared by 28%. And installers’ satisfaction with their training courses increased when compared to their previous LMS from 2-3/5 stars up to 5/5 stars. The functionality isn’t the only aspect that ChargePoint appreciated, it was the support from the LearnUpon team too. With partner training proving to be so successful, ChargePoint has begun to expand their training to new audiences. They first introduced courses for their sales team and found LearnUpon’s Salesforce integration worked seamlessly making training easy to access for their learners. The plan is to build a holistic university. One that caters to every learning audience. From customers and partners to employee professional development and compliance training, ChargePoint is taking advantage of LearnUpon’s functionality to lay the groundwork.